The Tadpole galaxy is a disrupted barred galaxy located 400 million light years from Earth in the northern constellation Draco. Tadpole galaxies tail of stars is one of the most striking features. It stretches across 280,000 light years whereas our Milky Way is about 100,000 to 120,000 light years across. The main body or galaxy itself is about 300,000 light years behind the tail. The Tadpole galaxy will likely lose its tail as it gets older. Now as you can see that the galaxy is disrupted and there is a theory of how that may have happened. 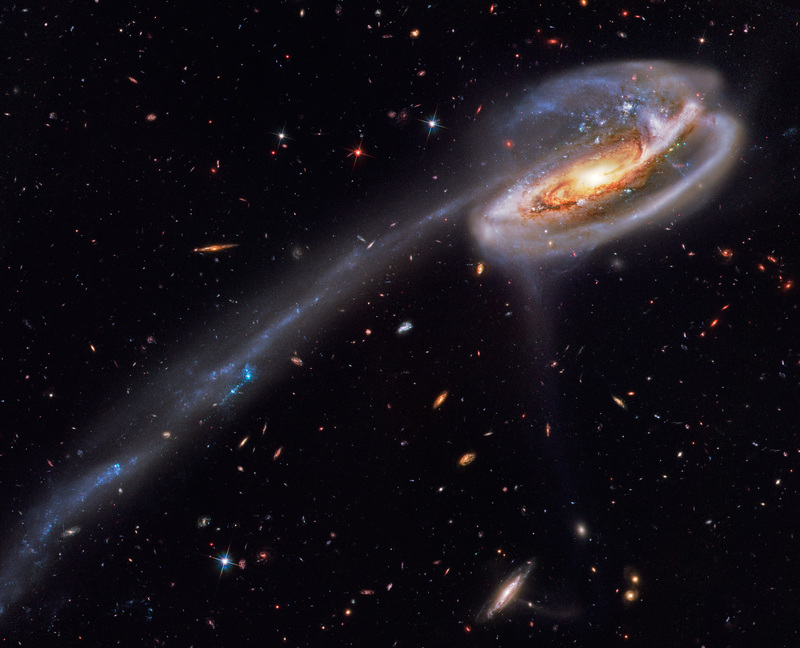 The story goes that a smaller galaxy collided with the Tadpole galaxy from left to right in this view. It was then slung around behind the Tadpole galaxy by their gravitational attraction. During this event the interaction drew out the spiral galaxies stars and the intruder itself can be seen 300,000 light years behind the Tadpole, can be seen through foreground spiral arms at the upper right.